If you've read my article about my experience interning with Neon Cowboys, you know that if you’re a college student, chances are you'll have to do an internship, either for credit or to gain experience in the field. Every university provides its student a series of tools, workshops and events to acquire internships or assets to implement in the process of applying to them. Whether you need help drafting your resume or mocking an interview, here are tools the University of Central Florida provides in order to help. 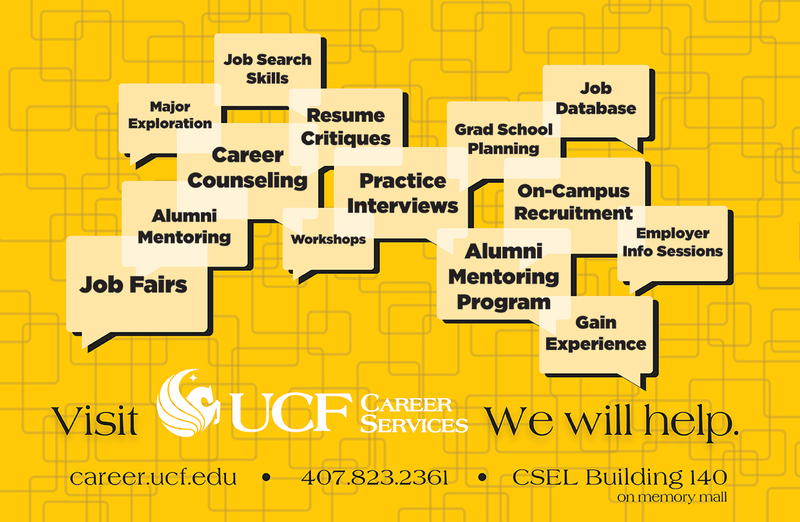 Career Services is a hub at UCF that offers various resources to undergraduate and graduate students, including internship fairs, career exploration, preparation workshops with mockup interviews, resume reviews, and wardrobe advice. My favorite, however, is a career service platform that allows students to discover jobs, internships and co-ops, called Handshake. Career Services organizes different types of internship fairs with over 40+ employers and workshops with specialists that teach the proper etiquette for interviews. Students should look into their events, like the JCPenney's Suit Up Event. This is a special partnership with JCPenney providing free consultations at their salon, free makeovers and up to 40% off on select men's and women's dress apparel. Did I mention this event is free of charge if you’re a UCF student? To provide more details on this platform (available to download on mobile as well), Handshake allows you to create a profile where you upload your information and see job offers in your area or selected location. Think of it as Tinder, except you're looking to match with your future employer. Not only can you see job availabilities, but it also shows you job descriptions, how compatible you are to the employer's preferences and similar jobs to the one you are viewing. Some might describe Handshake as LinkedIn's relative, having an extreme focus on student and their success in their field. If you haven't used Handshake, I highly recommend you give it a try. I could try to list all the internship fairs UCF does for its students, but the list would be extremely long. Being a large institution, UCF organizes its fairs by majors or departments. This is important to know because you don't want to attend a STEM fair while being a communication major. Don't get me wrong, you could go and possibly find great opportunities, but UCF strategically organizes it so students can benefit to the maximum. At this link, you can find a calendar UCF provides with its different career/job fairs, strategy workshops and other events that are extremely helpful to maximize a career. Now that you're educated on these mighty tools, try scheduling in an appointment for a resume critique, a mockup interview or career-developing event. These resources can change or guide your career in the direction you'd be wanting to go and should be maximized by everyone at UCF.